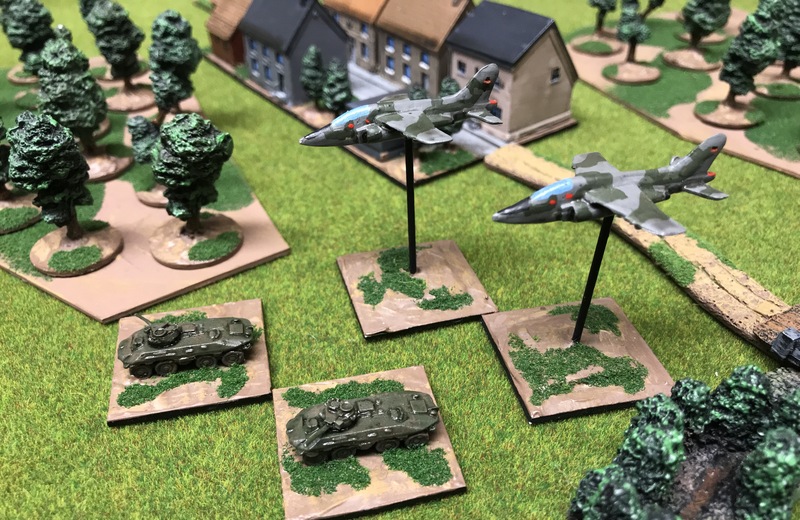 In years gone by I’ve tended to find myself using Soviets and typically found myself facing my regular opponent’s British. However, of late I’ve managed several games where I’ve used West Germans. It’s been an enjoyable change and as we have had the games in sequence it has allowed some evaluation of what’s worked and what hasn’t. 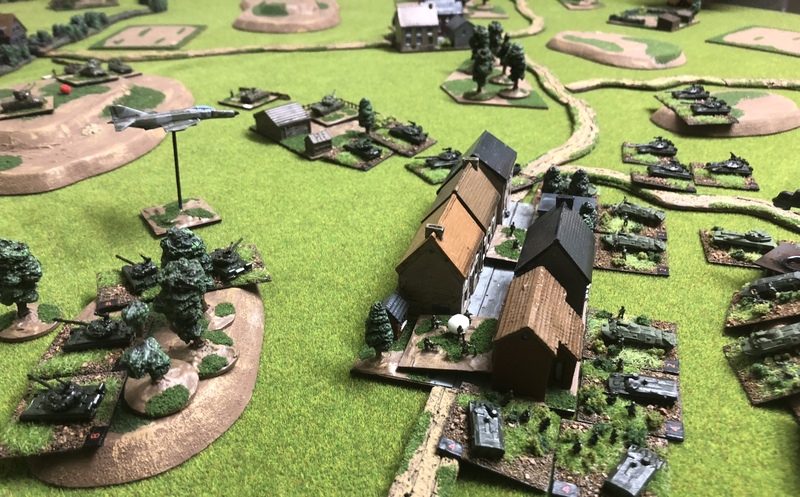 Indeed, across the last three games the West Germans have found themselves conducting a hasty attack, advancing in an encounter, and last night facing a massive Soviet deliberate attack. This mix has offered plenty of variety in itself. Further, both my opponent and I have been experimenting with very different force combinations. When conducting the hasty attack I opted for Leopard 2 as the armoured component, the first time in many years where I’ve used Leopard 2s. In the past I have found the Leopard II too restrictive in a three battalion list. This was especially so when facing enemy infantry where the the low anti-infantry factor of the Leopard 2 was particularly frustrating. 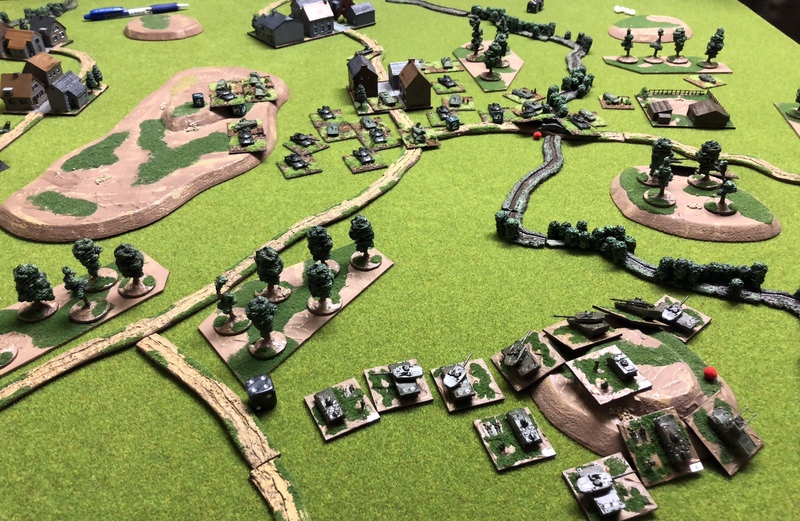 In the second game, above and below, I switched from my normal three battalions to just two battalions to face massed T-80s in a fascinating encounter game. Again using Leopard 2s both my opponent and I were struck by the power of these tanks, though possibly him more than I, which was pleasing. 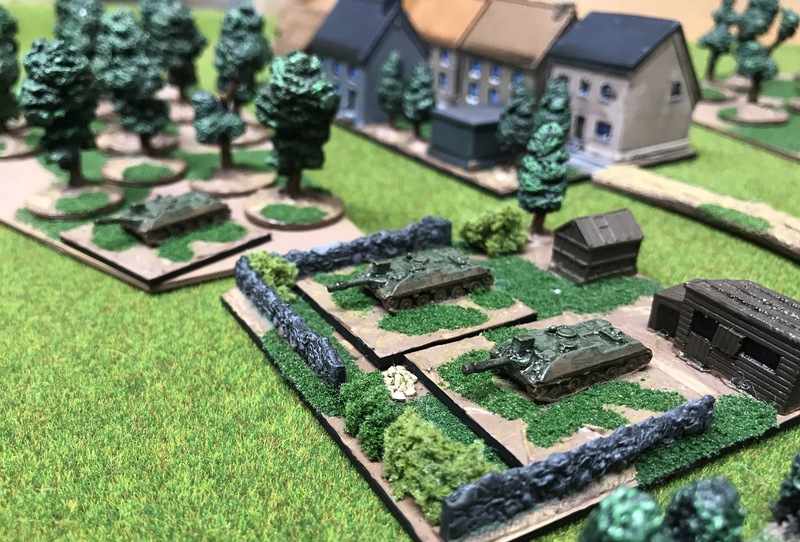 In last night’s encounter I dropped back to Leopard 1s and effectively just two manoeuvre battalions. 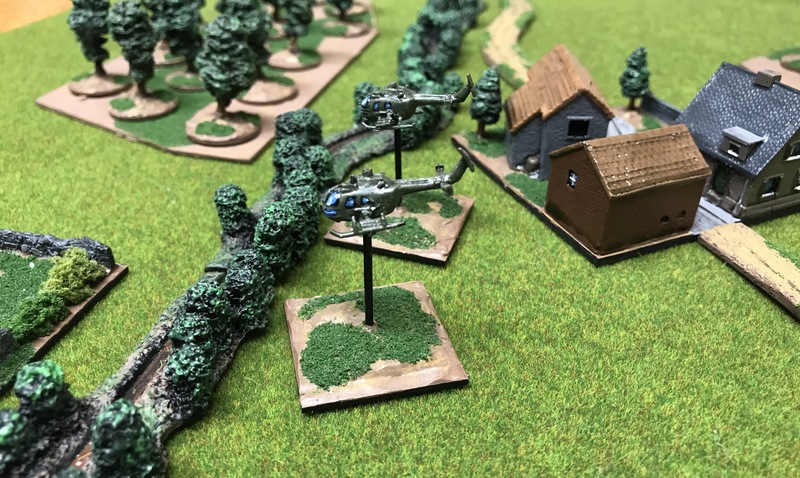 I was supported by a weak dismounted security battalion but they clung to the confines of a town desperately calling in artillery fires and dodging incoming artillery shells. 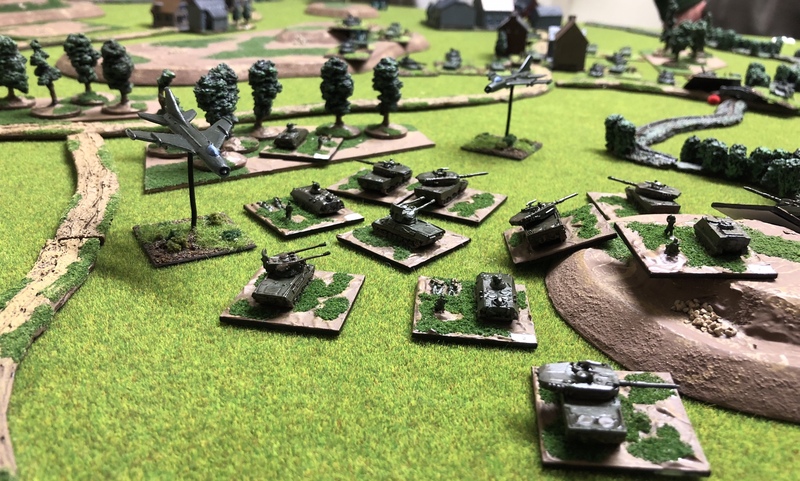 Anyway, this time the West Germans faced a massed Soviet deliberate attack, where my opponent selected an reinforcements (an Option B) and what seemed like half the Soviet armies heavy artillery assets. Thank goodness I had some Gepards to drive away of his Hinds and some Phantoms to give Ivan something to think about! My opponent has likewise has used plenty of variety. First Naval Infantry without any armour. This was then followed by a T-80 Tank Regiment and more recently elements drawn from two understrength Motor Rifle Regiments. Last night the Soviet Bear was on the offensive once more. 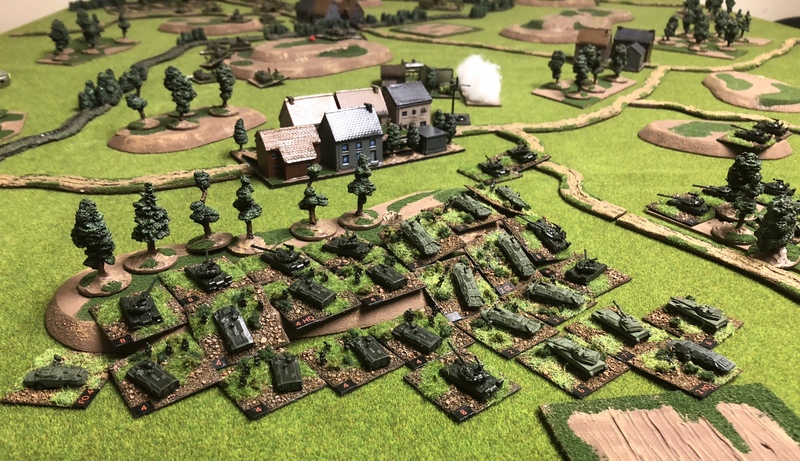 Now, the Soviets were supposed to be facing elements of BAOR but unfortunately the British player had to cancel. 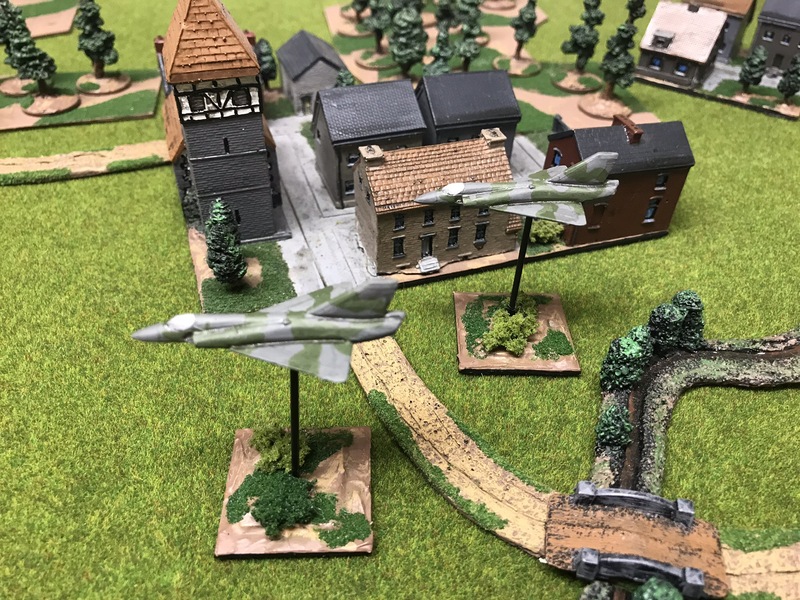 While Mrs Thatcher has ordered an investigation on why British forces were not ready to take their place in the line, the glorious French were called on for duty once again. 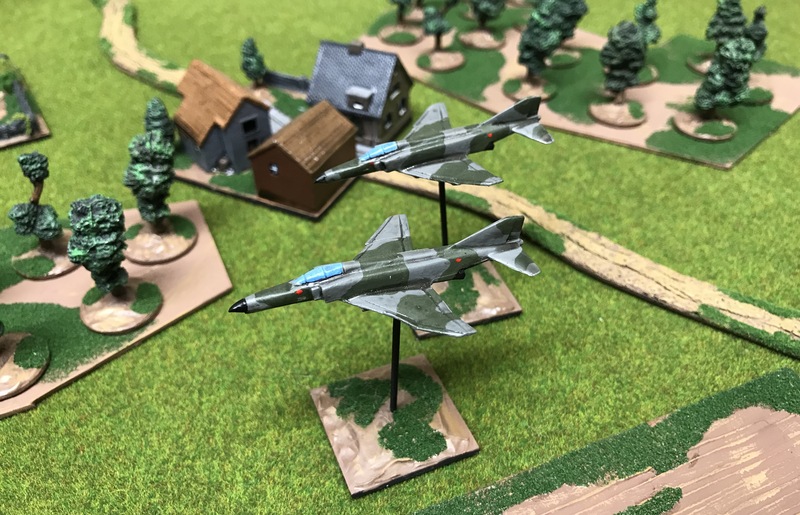 The scenario, developed using the Scenario Generation System, found the Soviets launching a deliberate attack – the French player having forgone the option of a spoiling attack. As General Pierre Sancelme waited for inevitable Soviet attack he pondered his deployments, and as is often the case, had second thoughts. Then, his mind wandered. Just five days ago he had been with his family at Landau. How quickly times had changed. Now his division were starting to consider themselves veterans. 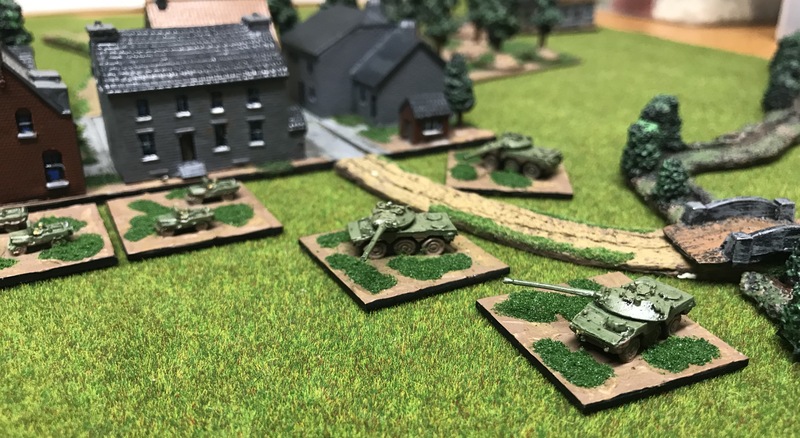 If the Germans and Americans could not stop the Soviet advance, perhaps the French could delay the Soviets while additional French forces moved forward. Certainly casualties over the the past days had been mounting. 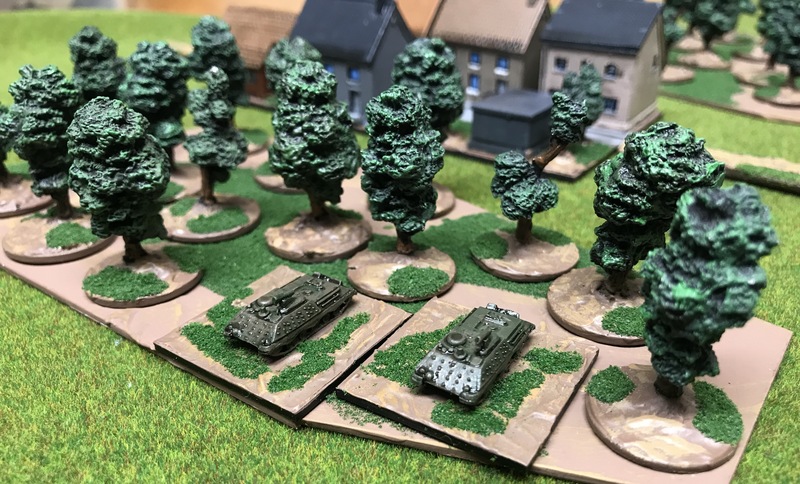 It was true since the previous action the battered 5th Armoured Division and while some reinforcements had arrived the various regiments remained understrength. Below, the area of operations. The Soviet forces will enter from the right. Again Sancelme opted for three regiments forward. But this time he was determined to fight a more mobile battle with at least one of the regiments repositioning early. With again a considerable divisional room to hold the three forward fighting regiments (battalions) were stretched. Sancelme placed the 153 Regiment d’Infanterie, a VAB equipped infantry regiment, in the centre around the town of Anselfingen, with a further company forward in the village of Pressat. Below, elements of 153 RI deployed around Anselfingen. The village of Pressat in just over the river, and not shown. On the right was 2nd Groupement de Chasseurs, while on the left was 24th Groupement de Chasseurs. Both were mechanised regiments each with two mechanised companies and elements from two tank companies, though understrength and each fielding around 12 AMX-30s each. Divisional artillery assets were limited. Just 12 tubes from 12th Regiment d’Artillerie would be available. Instead, the various regiments would need to rely on their intrinsic 120mm mortars, carefully dispersed to lesson the impact of counter-battery fires. At 2pm reports came in of a massed advance against the French left. Two Soviet Motor Rifle Battalions were tasked with securing the ridge and woods northeast of the town of Baudenbach. A Tank Battalion and Divisional Reconnaissance Battalion moved forward further to the right in a turning movement against the French left. Two of the Motor Rifle battalions were directly supported by 2S1s while the advancing regiments had additional fires from divisional 2S3 assets on call. In all the Soviets were advancing on a width of just 2kms and elements of seven artillery battalions in various levels of support. As expected a series of massed artillery strikes began to hit various French positions. On the left the high ground The ridge running east to west near Baudenbach was hit by concentrated fires by three artillery battalions. This included BM-27 rocket launchers firing improved conventional munitions as well as two army level 240mm mortar battalions. Advanced mechanised platoons were also subjected to concentrated 2S3 fires, a mix of ICM and conventional HE. Despite these horrific fires all advanced elements emerged combat effective from these initial bombardments – though all shaken! Sancelme had reiterated to his regimental commanders the importance of deployment in reverse slope or secondary positions. As a result many positions which were later targets of equally hit by artillery fires were unoccupied. By 2.30pm and with French positions still subjected to artillery fire Soviet armour moved into range of advanced French positions. 1st Company, 24th Groupement de Chasseurs would engage the Soviet T-80s that advanced by short halts on the ground below for around three hours. 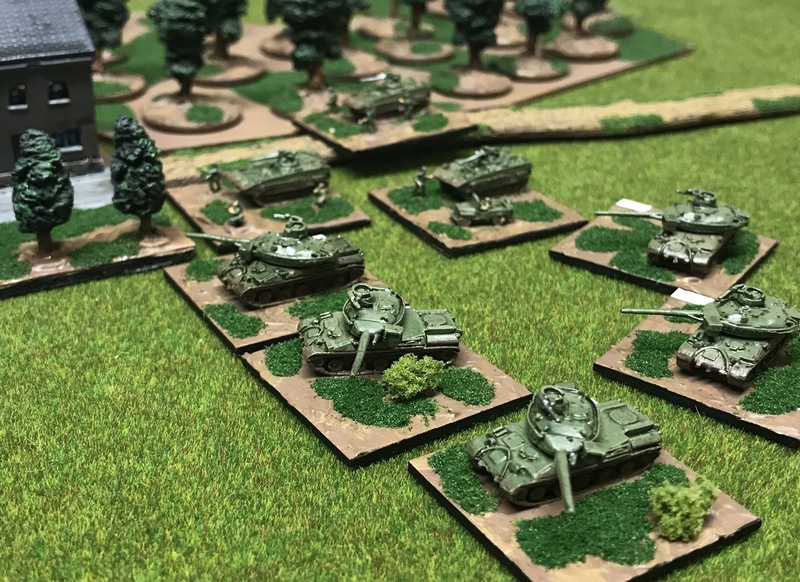 Constrained by terrain and harassed by French tank fire and occasional French 155mm artillery fire, the Soviet T-80s milled around in some disorder unable to adequately gain the upper hand while casualties slowly mounted. Above, 1st Company 24th Groupement de Chasseurs engages Soviet armour. To their left a covering force of French mechanised infantry is deployed in the woods where it was subjected to pre-planned artillery fires. When 1st Company was initially engaged, and expecting a movement by motorised rifle infantry to support stalled Soviet armour, Sancelme ordered 153rd Regiment d’Infanterie to conduct a spoiling attack. It was to pin the Soviets and support the advanced elements of 24th GC. Below, 153 RI can be seen conducting its spoiling attack. In the left rear elements of 24th Groupement de Chasseurs can be seen in a reverse slope position behind the first Soviet objective, denoted by the red marker. Shortly after 2nd Groupement de Chasseurs was ordered to conduct a rapid movement from the right flank to the left deploying to 24th Groupement de Chasseurs’ rear and therefore bolstering the French left rear. The VAB equipped infantry regiment moved quickly to draw off Soviet infantry. 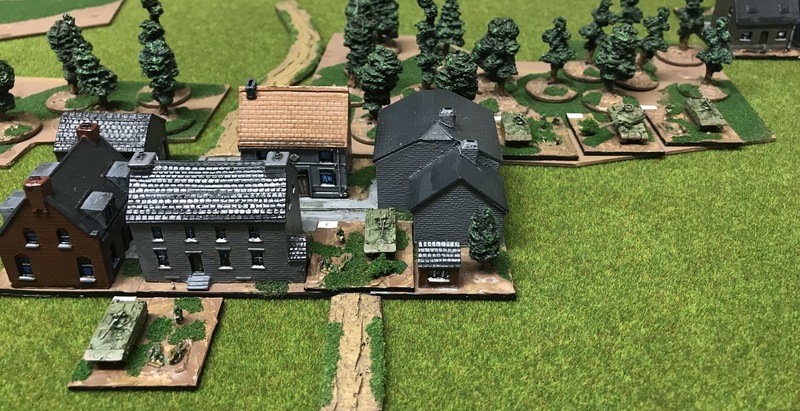 Confused fighting took place along the eastern outskirts of Baudenbach and stretching to within 400m of the positions 1st Company, 24th Groupement de Chasseurs on Baudenbach Ridge. Unfortunately, the attack by 153 Regiment d’Infanterie was broken up with little gain by Soviet infantry fire, well supported by 152mm artillery fires and in some cases 2S1s firing in direct support. A subsequent order to retire was issued too late and as a result the regiment broke – a result of further casualties during its withdrawal. Survivors would however reform around a kilometre from their original position. Meanwhile, while one Soviet battalion was held up in the valley two others had pressed forward and were soon engaged against the French second line. Here additional AMX-30s and mechanised infantry exchanged fires with advancing T-80s supported by BMPs. Above and below, the battle around the French left. 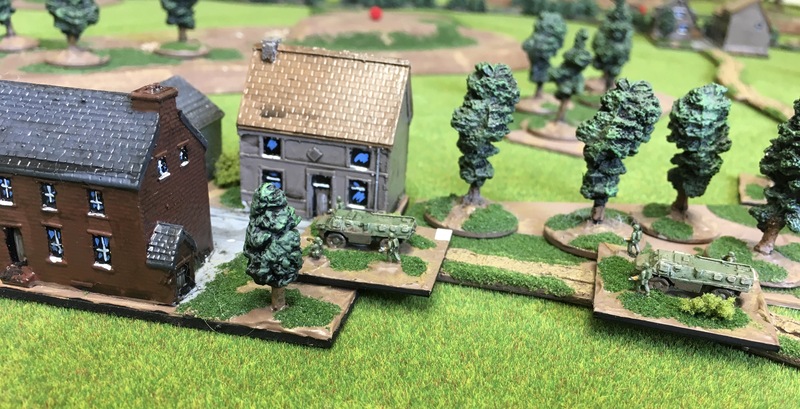 Below, the 1st Company of 24th Groupement de Chasseurs has finally been overwhelmed has been overcome and Soviet forces press forward, despite further ATGW fires from other French companies. Simultaneously, elements of 2nd Groupement de Chasseurs are by now deploying to bolster the French left. Below, AMX-30s and AMX-10s move under the cover of 24th GC’s attached AMX-13 DCA, a self-propelled 30mm AA system. 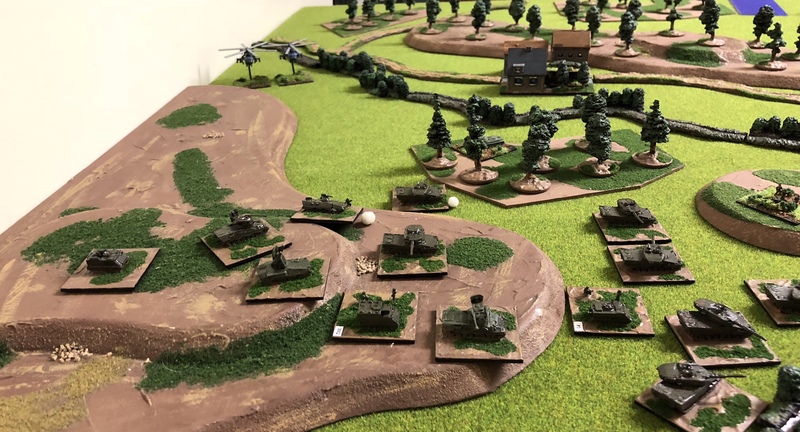 Last night’s Modern Spearhead game, a hasty attack by Andrew’s new Soviet Tank Regiment has me pondering yet again how to create an effective defence. Andrew has this wonderful ability to conjure up very different armies. I never really no if I will be fighting T-55s using second line equipment, Naval Infantry supported by PT-76s, helicopters and aircraft, or some new monster such as the T-80s I encountered last night. I tend to think I can operate a flexible defence, especially with NATO, so that a specific battalion plays can change its role in the defence. An ability to react, reposition battalions and counterattack, are all key requirements. But yesterday’s massed armoured thrust caused me serious problems. My French defend list comprised three battalions, or regiments in French organisation. Two mechanised, with AMX-30 tanks and AMX-10P mechanised infantry, while the the third was comprised infantry in VABs. Deployment required two battalions forward with a third in reserve and guarding the flank. I expected a pinning attack in the centre and a flanking action against my left flank. Other options, and there were several, could have had seen alternate avenues of advance. In my plan the most likely counterattacks would have been with my reserve or the VAB battalion against an exposed centre. Above, part of the the French 1st Regiment (Battalion) in defensive positions. The town on the left was taken by Soviet Divisional Reconnaissance Battalion as stage one of a move against the French left. Below, the same position from a different angle showing more of the French centre and forward left, as well as the advancing Soviets. Unfortunately my defence was almost immediately paralysed. 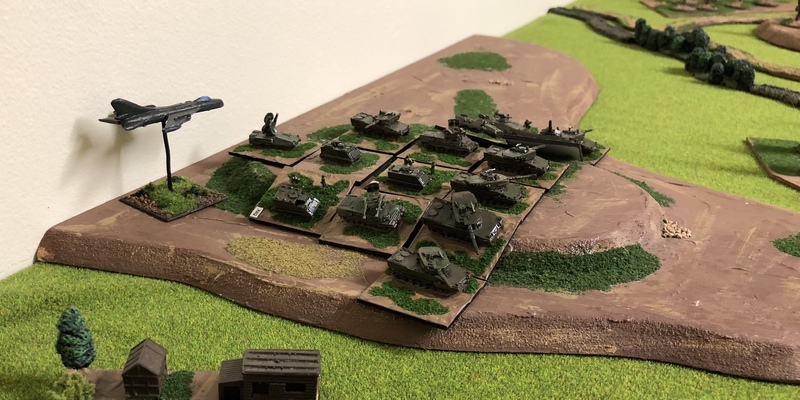 I just didn’t feel I could effectively manoeuvre against a bristling armoured formation which would have seen the outnumbered and advancing AMX-30s stripped out by T-80s and the AMX-10Ps quickly overcome. Manoeuvring the VAB equipped battalion was even worse. Lacking any armour and with fewer Milans their ability to counter armour is much reduced in defence, never mind on the offensive. Despite what must read like a degree despondency, the game was fascinating. The engagement opened with Soviet shaping of the area of operations with electronic warfare locating French air defences quickly followed by fires by BM-27 rocket launches and 2S5 artillery assets. Their was no Soviet aircraft though so this at least had limited impact. 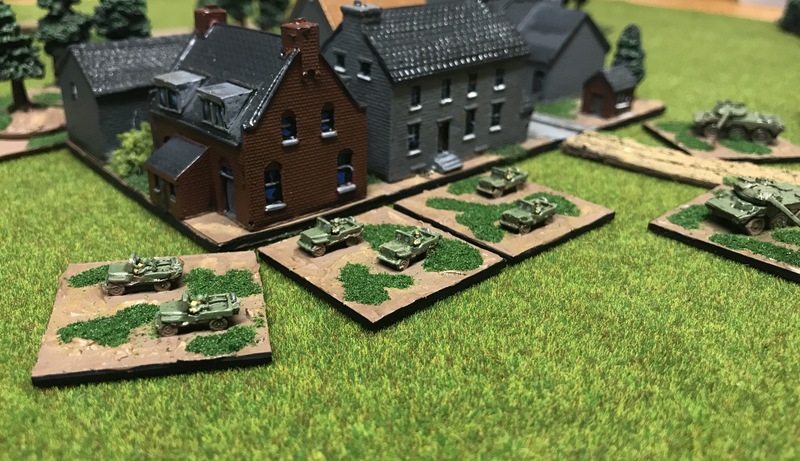 As the divisional reconnaissance moved towards its initial objective three tank battalions each allocated a BMP infantry company and some 2S1 artillery for direct fire support moved forward. French artillery attempted to suppress the BMPs while the French infantry engaged with Milan. The terribly outnumbered AMX-30s gave a reasonable account of themselves but were silenced by return fire. Then, as the T-80s advanced they were engaged with Milan. Here at least there was some hope as the Soviets, despite heavy artillery fire had considerable difficulties dislodging the French infantry. French artillery continued to fire but their fires were interrupted by relocation – to avoid the expected devastating counter battery fires. Above, a view from the Soviet lines. The BMPs are suppressed by artillery fires. A 2S1 can be seen behind the advancing T-80s. Below, the advanced French positions have been neutralised and Soviet armour continues forward. 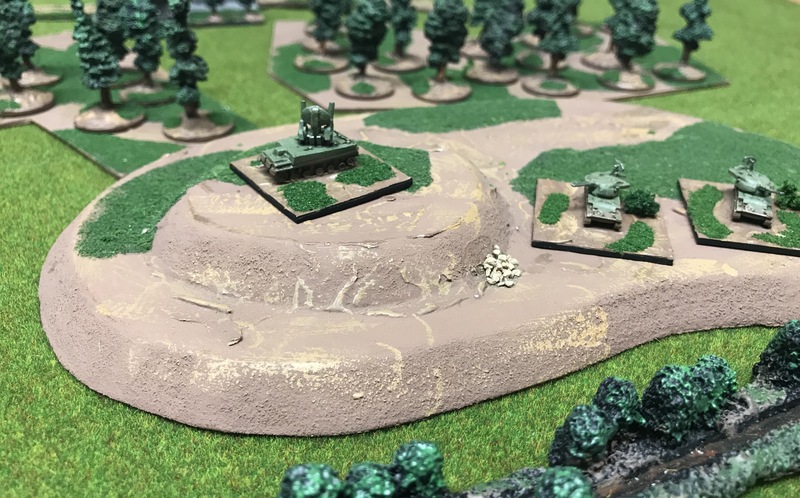 French artillery fires now target the T-80s in a desperate attempt to disrupt the attack. I’ve always been somewhat surprised that the West Germans are infrequently seen in these parts. Especially as the West German formations formed the backbone of NATO armies by the 1980s. 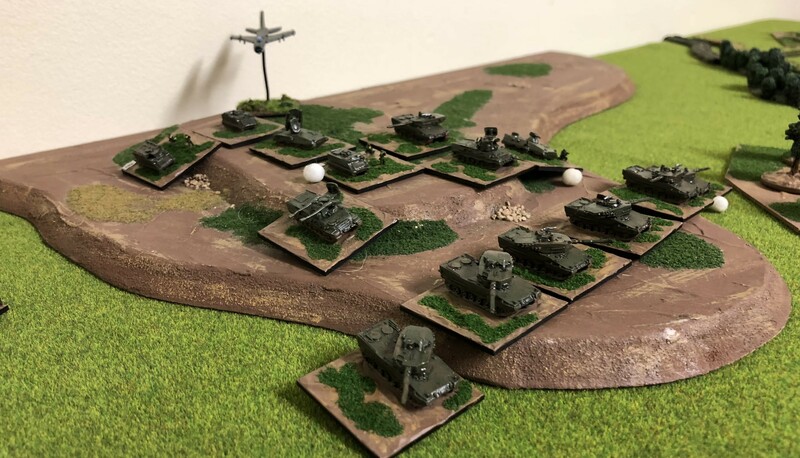 Continuing with my occasional posts on forming armies this article looks at forming a Panzer Grenadier Brigade for use in the Scenario Generation System. Now, I suspect the use of West Germans formations under the Scenario Generation System is reduced by the points system. In particular West German formations are relatively expensive due to the use of IFVs. A contrast to the American M113 or British FV432 combat team which is relatively inexpensive. My West Germans were my first NATO army under Modern Spearhead and they remain an interesting, and I feel, capable army. As is the norm here I based my West Germans around 1982. The two lists I will present here are based around Panzer Grenadier Brigades and I feel provide a reasonably balanced force structure. However, rather than provide a list I hope a few of you find a little inspiration. A Panzer Grenadier Brigade has four basic battalions. 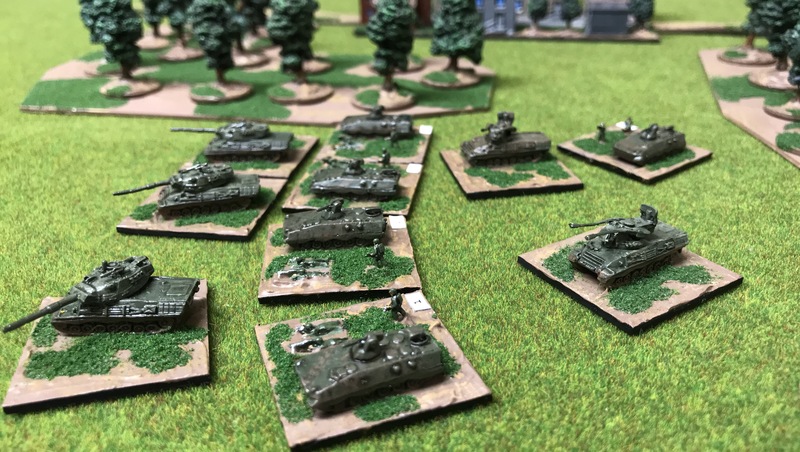 A Panzer Battalion, two Panzer Grenadier Battalions and a Mixed Battalion. The last having no HQ under peace conditions. Each battalion comprises three companies. These three companies can be cross-attached or operate without cross-attachment. Let’s begin by looking at the armoured options. The Panzer Battalion comprises three companies and excludes an infantry component unless through cross-attachment. At the moment I have Leopard 1A2, Leopard 1A1A1 and Leopard IIs in my collection which allows me to model several different formations. For now I will focus on the Leopard 1s and will look at the Leopard 2 in another article. The Leopard 1 went through several upgrades and for my purposes the Leopard 1A1A1 is the most common in 1982. It has many of the physical characteristics of the Leopard 1A5 allowing me to use the excellent Heroics & Ros Leopard 1A5 casting to represent the Leopard 1A1A1. Above, Leopard 1A1A1s supported by a company of Marder equipped panzer grenadiers. A Brigade HQ, represented by an M577 command stand, can be seen in the rear. The Leopard 1A2 was produced as part of the 5th batch of Leopards. It was not upgraded during the main upgrade program. As a result, and most notably, it didn’t receive the add on turret armour. The model I have are, I believe, from Skytrex. These models were gifted to me several years ago by Steve Weiss a SH/MSH gamer in New York as part of an “moderns aid package”. Historically the Leopard 1A2 were mainly deployed in the 6th Panzer Grenadier Division. As such they often exercised with Danish forces. 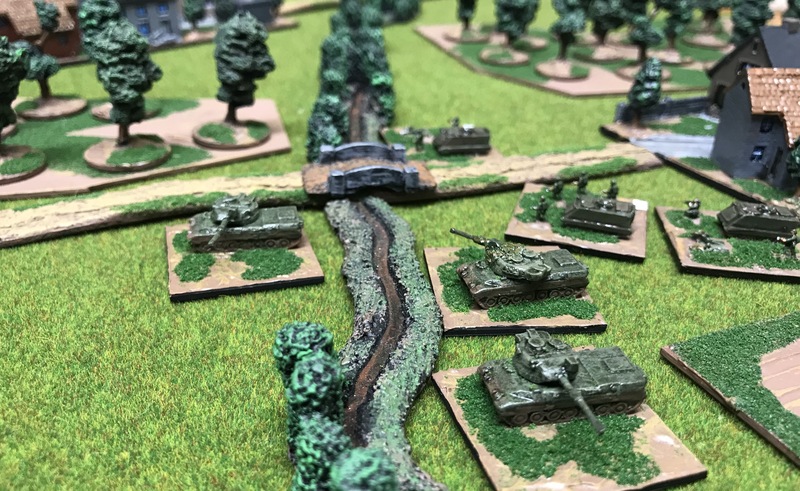 Below Leopard 1A2s, supported by a panzer grenadier company in M113 APCs, cross a small stream. Each Panzer Grenadier Battalion comprised two companies mounted in Marders while the third is in M113s. Cross attachment, by company, is particularly important to achieve combined arms and I almost always base my battalions on a mix of companies. That said, as each platoon contains Milan a degree of independence can be maintained and a Panzer Grenadier Battalion could operate without panzers. One particular strength these battalions is the Marders. The Marder IFV, being a true mechanised infantry combat vehicle, provides considerable protection for the infantry from enemy artillery fires. This is especially so when under Soviet 122mm fires. In addition the combat factors, a result of the infantry, vehicle and ATGW systems, provide a capable system weapons system in 1982. In contrast the M113 mounted companies provide less offensive and defensive power but have a lower points cost. In my view a critical part, and sometimes overlooked part of these Panzer Grenadier battalions, is the M113 mounted with a 120mm mortar. These indirect fire weapons provide each battalion with a degree of organic fire support. Useful, and almost always available, the are useful in suppressing enemy infantry. However, being self-propelled they are less prone to counter-battery fires, though do remember to move them frequently! The fourth battalion is the Mixed Battalion. It comprises a panzer company and two panzer grenadier companies in Marders. Unlike the Panzer Grenadier battalions it lacks a mortar section and unless mobilised an HQ platoon. I believe that elements from the Brigade HQ form the headquarters, though details are conflicting. I have decided to represent this HQ by a Marder element. Specialised anti-tank systems were a critical part of the West German force structure. Each brigade had one company. Some Brigades fielded the Jaguar 1 armed with the HOT ATGW system, which had mostly replaced the earlier Jaguar armed with ATGW SS11. Other brigades fielded a company of Jagdpanzer Kannone. I must admit my personal favourite is the old and increasingly ineffective Jagdpanzer Kannone which retained a 90mm gun. The 90mm guns were sourced from decommissioned M47 tanks and the vehicle has a number of similarities to the excellent, in WWII terms, Jagdpanzer IV. 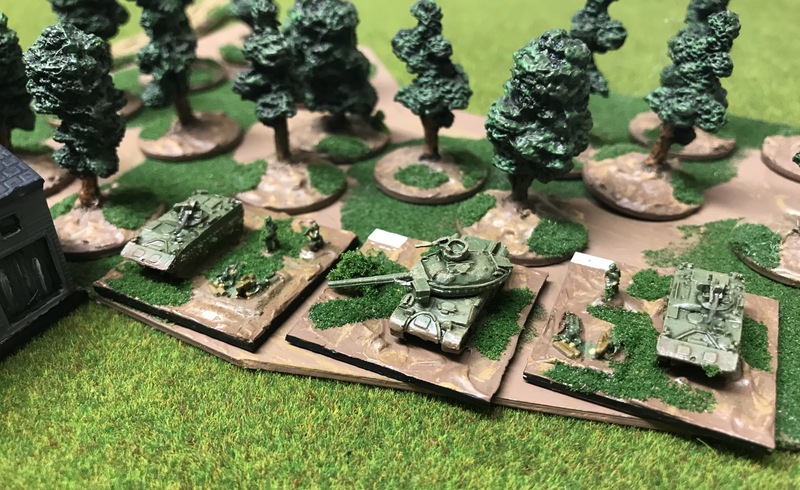 Above, Jaguar 1s deployed along a woods edge, while below a company of Jagdpanzer Kannones deployed in ambush in field and woods. Many Kannones would be upgraded to Jaguar 2, armed with TOW, while others would soldier on in reserve formations until 1990. Other core components of the brigade include the brigade’s own artillery battalion. Equipped with the excellent M109G with its improved howitzer with a range of 18,000m is effectively an M109A1. Self-propelled and held in brigade support it can be called in reasonably easily by fighting stands and recon elements. Divisional assets include additional artillery systems in the form of FH-70 towed guns and 110mm rocket battalions. Both are able to support with fires into the battle area. However, the FH-70 is useful for deep fire missions against enemy artillery or air defence systems. Very useful if your opponent plans to deploy towed artillery systems. West German formations, unlike some NATO allies, had a solid anti-aircraft arsenal. Each division comprises specialist man portable SAM as well as Gepard self-propelled gun systems. This is further supplemented by Roland SAM at Corps level. Below, Gepards provide support for elements of a Panzer Grenadier Battalion. Fixed wing air support has an ability to quickly overcome an enemy concentration. As importantly it can strike at any part of the brigade battle area. I usually ensure a Forward Air Controller is present, but when points are restricted a reconnaissance stand, an HQ and even fighting stands can request support. 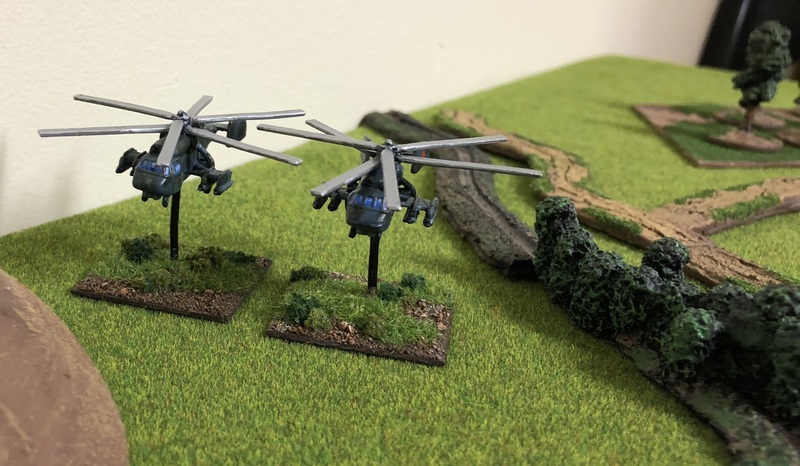 Below, relatively inexpensive Alpha Jets overfly Luchs reconnaissance elements. These light attack aircraft can be armed with rockets, bombs or Improved Conventional Munitions (ICM). Consideration should be given to the weapon load. For example if the enemy is likely to be on the offensive ICM can be more useful than rockets. However, to achieve success the enemy air defences must be reduced. The obvious way to do this is via artillery strikes on located radar SAM systems. However, Phantom fighter bombers can also be used. Their avionics and countermeasures are useful and potentially allow the use of weapons such as smart bombs to suppress enemy missile systems. Subsequent attacks can then be made by other aircraft armed with more traditional weapon loads. The PAH-1 helicopter, armed with HOT, can be a useful weapons platform to countering enemy armour and for targeting AA systems allowing fixed wing support to be more effective. Like the fixed wing aircraft I tend to operate these as options in the list. This forces my opponent to consider his air defences in both attack or defensive postures, without me having to always commit to using a specific system each game. Having described a few of the elements available I will now provide some sample lists which I hope provide some inspiration. You will note some companies are under strength, representing casualties. There are a couple of variations from the official TO&E, I will cover these off in future posts. The Attack List is the most self explanatory. I see it being used hasty attack scenarios and for encounter situations, when the Scenario System selects this list. I don’t believe it is useful for or the West Germans in general should attempt a deliberate attack. It contains three manoeuvre battalions with reasonable indirect fire support. The Panzer Battalion could be used massed but more typically one or two companies are allocated out combined arms battalions. An under strength Jaguar company provides heavy ATGW support while a range of artillery is available. A range of options include fixed wing air support, additional artillery for counter-battery fires or air defence suppression. Care should be made when allocating resources to battalions so as the overall attachment limits are not exceeded. Of course the brigade is not well suited to frontal engagement, so try and use manoeuvre to gain advantage, forcing your enemy to redeploy. The sample Attack List can be found here. The Defend List is more complicated and with fewer points more difficult to achieve meaningful combined arms. In defence the three battalions are thin on the ground and each is limited in armour. 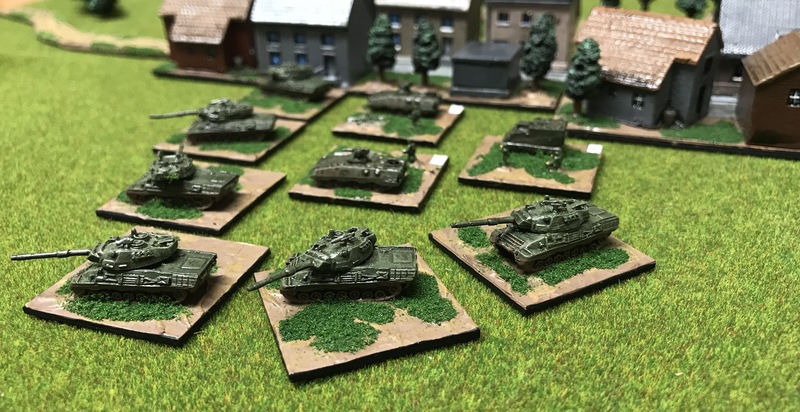 Unlike the previous list armour is already attached with one battalion of the brigade presumed to have been deployed elsewhere. The Mixed Battalion is small and should act as a mobile reserve reinforcing the other battalions. This not withstanding careful deployment of the fighting stands and support weapons will be required. Often a brigade commander will be tasked with a difficult situation or be on the offensive. In these situations the options can be selected to bolster the defence, disrupt the enemy or add teeth to the fighting battalions. Options include air support designed to attack advancing enemy vehicles, additional AA systems and additional artillery. The Option B is specifically design for the spoiling attack scenario where a commander conducts a preemptive attack before an opponent can launch a deliberate attack. This provides reinforcements, additional artillery and most importantly additional mechanised AA systems. The sample Defend List can be found here.